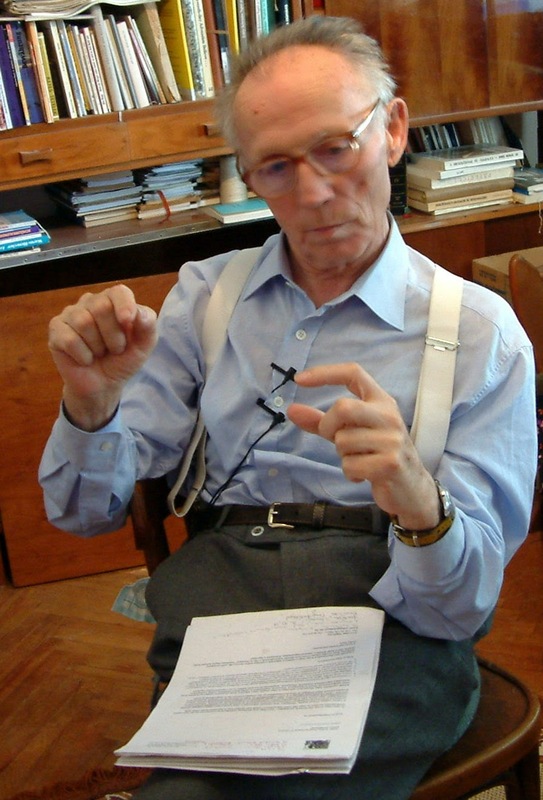 When we translated Ferenc Visky's interview, I was struck not only by the originality of his understanding of the Psalms, but also by his awareness of God's presence in his life - even as he recalled events that were decades old. He, like many others no longer within the walls of Gherla Prison, lived in the shadow of the secret police, the Securitate. He once described his release as going from a smaller one into the larger prison of Romania. To maintain a tone of terror in this prison world, the Securitate could demand admittance to any home, anywhere, anytime. Considered enemies of the state, the Visky family was a regular recipient of such visits. In 1980 we were free from prison but had another house search one day when we were having breakfast. Five people entered, secret police from Bucharest. One was an important officer; it was a very distinguished group. After they entered, they showed us their permit to search. I said, OK, and we continued having breakfast. We asked them to have a seat in another room because there was no place for them to sit in our breakfast room. They declined and instead chose to stand in the room with us. So, we continued with our breakfast. I could see that they were uncomfortable with the situation, standing and watching us calmly eating. We should have been the uncomfortable and anxious ones, but they were. This was good. Then we started to talk and I told them that I had known that they were coming that morning because I had read Psalm 23 in my Bible that said, “The Lord is my shepherd, I shall lack nothing. Even if I am in the valley of the shadow of death etc. etc. etc. I told them that this was a treasured psalm for me. The officer looked startled and asked me how I knew. I didn’t need to be asked twice, so I began to explain. It meant a great deal to me, I said, that in the Word you can read, ‘You make the table for me in the presence of my enemies. My cup is full and I have no fear even in the valley of death because I know you are with me and your hand holds my hand.’ I told the officer, Usually in a situation like we are in, the appetite of the man about to be arrested is always gone, but now you brought my appetite instead. They looked puzzled, so I had to tell them that I had a good appetite because the text says that God is the one who prepares my table. So, I continued, God is my waiter today or I should say, host. Please understand that God is very near to us, but he doesn’t always put on the table the sort of meal that I really like. For instance, presently, I do not really like what you officers are going to do with us after a few moments, but I’m not looking at the things that are on the table. I’m looking at Him who put you on my table, and this is why I have a good appetite. And this is important to me, that I can be liberated this way at such a moment. This is the message of Psalm 23. Beth - this is a beautifully written message; I can picture the frustration and amazement of the police and wonder at Visky's calm faith at such a time. Meeting this couple was an event I will never forget. His storys and preaches are showing a men so close to God. He was reading His words as a livesaving word. It shaped me into another men in the front of God.